Stone Veneer Edison, Siding | Window & Door Outlet, Inc.
One of the easiest ways to transform your home’s exterior is to add realistic stone veneer that can create an aesthetic that is unique to your home. Realistic stone siding can provide an accent that will make your home stand out from the others on your block in Edison or another city in Central New Jersey. 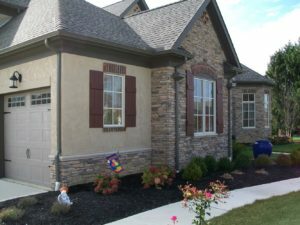 Window & Door Outlet, Inc., installs stone veneer manufactured by some of the top names in exterior home improvement. We’ve been helping homeowners upgrade their properties since 1997, and our commitment to providing customer-focused service and precise installations has allowed us to maintain an A+ rating with the Better Business Bureau for many years. If you’re interested in learning more about the stone veneer options offered by Window & Door Outlet, Inc., visit our spacious showroom today or schedule a consultation at your home in Edison or another city in Central NJ. To see more images of our stone veneer visit our Gallery!